Keep an eye on candles. 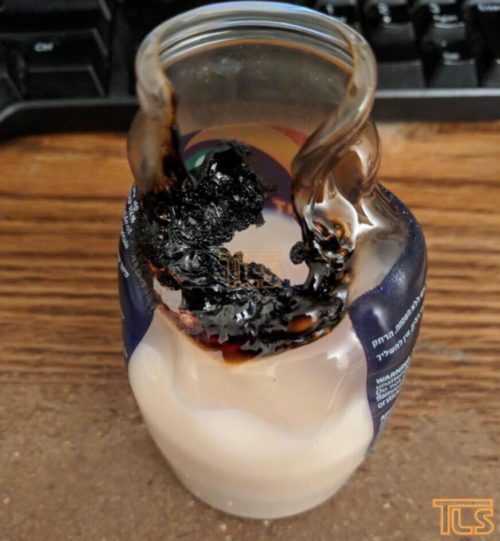 Resident says this 3-day candle holder caught fire. There are 7 Comments to "PHOTO: Keep an eye on burning candle"
Thats alot to ask…. stay awake for 3 days Better yet, place candle on a metal tray to prevent spreading of fire. This does not look like glass. Do NOT use the plastic ones. These plastic containers are a sakana and should be banned. In that pic is a plastic candle holder! DO NOT USE THE PLASTIC CANDLE HOLDER! It is vey dumb whichever company put that out and it should be taken off the shelves ASAP!